Confessions of an ADD English Teacher: How to save money on produce? I'm always thrilled to answer reader questions, especially ones about saving money! Don't forget to check out the facebook page. And if you have a question or a request for a post, please let me know! Wanna share some tips on how to score cheap at the farmer's market? I want to shop there more but find myself thinking that I can get it cheaper at the grocery store. Certain days of the week or times to go when you can get deals or am I going to the wrong farmer's market? I love shopping at the farmer's market. It's open year round here. I really wish I had some magic trick for getting great deals on produce. It's just like any other big sale. Sometimes you just have to be at the right place at the right time. Before we get started at the farmer's market (since most of you don't have them year round), let's talk about the grocery store. Many couponers use overage or $ off total purchase coupons to cover the costs of non-coupon items like produce. Produce coupons are there. They don't happen often, but when they do, it's usually a printable online or a peelie/blinkie that requires the purchase of another item. The one I see most often is free bananas when buying Nilla Wafers. Some stores will also mark down their produce if it's ugly, bruised or getting overly ripe. You've probably seen the brown bananas in bags or tied together and priced for about half of the other bananas. Ask the produce manager if they mark down the fruit at all. One store I shop doesn't mark down the produce at all. It gets donated instead. The other store I shop will gather the fruit and put them in plastic wrap with a mark down sticker. Ask the produce manager when they do the produce markdowns. You stand a better chance of scoring some great deals if you're there bright and early. They may also do this with dairy products. That's how I scored the 15 cent yogurt last week! The produce department may also markdown things like mushrooms, bagged veggies, salad dressings or bagged salads with store coupons. If you are lucky enough to find these, you may also stack them with a manufacturer coupon. Even better, is if the items are on sale. Items can be under $1 or even free! The kicker for all of this is the items need to be used quickly. With a large family, it's not really an issue for us. Keeping the use quickly in mind, we can move on down the street to the farmer's market. In our city, we have a farmer's market and a curbside market. They aren't affiliated. The curbside market is on down season right now, so the deals aren't great. However, if you are heading to a farmers market find a big one. For my local readers, that means the one on Federal Drive. During the week it's pretty quiet. Not too many vendors. As summer approaches the number of vendors will increase and so will your chances of getting a great deal. Culled Fruit is your friend. It's the fruit that's damaged, ugly or nearing peak ripeness. It's going to be thrown away unless the vendors can sell it. And they want to sell it. Every piece of fruit or vegetable that is thrown away is money they lose. This is where you can save the most money. Culled Fruit is your friend! Ask the vendor if they have any culled fruit. Tomatoes are the most plentiful. The vendor may even call them soup tomatoes. They are perfect for turning in to something else like salsa or homemade spaghetti sauce. Depending on the season, you may find other deals. I can't stress how much of this is just asking. Ask what the best deals are. If the vendor has too much of something, you may be able to get a lower price just to clear the merchandise. I don't even want to think of what the retail price of all of that would have been! The other big bonus of shopping the farmer's market here is there's no sales tax. That's another 10 percent savings! Fabulous! Thanks for the tips! I tend to buy the "ripe" bananas at Winn Dixie in the bags for the lower price because they are gonna get eaten in a day here anyway. You are just full of good information. I am jealous of your farmer's market produce score for $11. I want to go to the farmer's market RIGHT NOW! 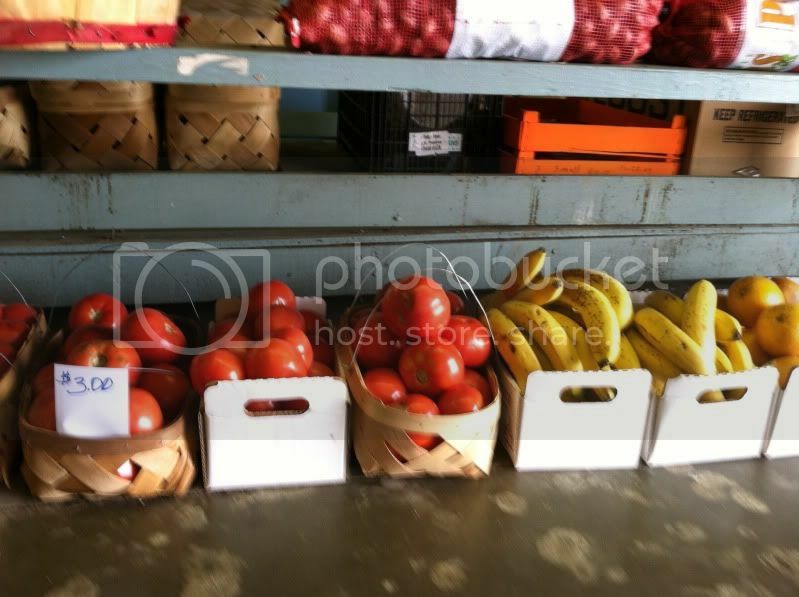 There are some smaller grocery stores scattered around that sometimes have cheap produce. Sometimes you just have to go to more than one store to get the best deals. And look at the ads that you get in the mail because then you'll know where to get what. That's really true. It depends so much on the store. I didn't even get to the price matching you can to keep from driving everywhere! The key for me (in Northern California) is to buy what is in season and stock up. Right now we can get certified organic strawberries for $1/pound at our FM. I have so many in my freezer I am pretty sure we will never run out. But when January rolls around and I want strawberry pie, I won't have to shell out $6/box! :) I never thought to ask about the culled.. I may have to try it!